Currently working full-time as a family physician in Vancouver, from his home base David Browning writes little gems-of-tunes about personal relationships both psychological and worldly. He gives forth that worldview on his new EP, Now You See Me. Browning mans the keys and sings along with producer Ian Prince, who lends his hand in programming and playing keys. The three songs here are presented with a studied lush sweetness and a fair share of danceable moments. There’s the slower snap percussion and echo-y electronic keys of “Stay Over,” that all-too-quickly give way song to a great dance trip in the song’s choruses and drum programming. I love how this one takes flight in the swirly choruses then dips back down to the modern R&B-like verses. Great song crafting here, as well as playing and singing. “Call Me When You’re Single,” again employs some percussion snapping, but features acoustic (at least acoustic sounding) piano and sailing strings. The chorus moves us again, with Browing’s voice maybe even better on this one. The last song, “Always Inside,” is a big concept torchy piano ballad, strings included once again. On each successive tune Browning showcases his pipes even better than what went before and he starts Now You See Me with some great singing indeed. 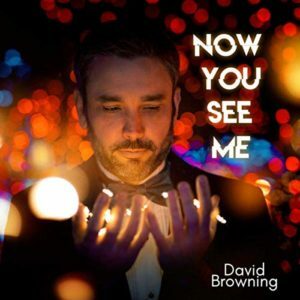 Canadian modern pop artist, David Browning’s Now You See Me is a wonderful lush release of modern romance, played, produced, sung, and written impeccably. You need to see this album.